Tidal marshes are Focus on the Coast's priority coastal resource #1. 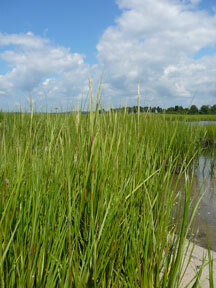 Tidal marshes include all vegetated wetlands along the coast and along the tidal stretches of our coastal rivers. There are salt, brackish and freshwater tidal marshes. Tidal marshes provide invaluable protected habitat for many juvenile fish species, birds, and other wildlife, help to cleanse polluted water, and protect against storms and floods. Brackish tidal marshes occur where the saline waters of Long Island Sound mix with fresh water from coastal rivers and other sources. Within these areas, one finds many of the same species found in salt marshes such as smooth cord grass but a closer inspection reveals numerous other species as well such as spike-rush and eastern lilaeopsis. Those familiar with these coastal areas know that these brackish marshes are often dominated by tall reed-like plants – either cattails (Typha spp.) or common reed (Phragmites australis). The CT Dept. of Environmental Protection, The Nature Conservancy, Connecticut College, the Natural Resources Conservation Service, U.S. 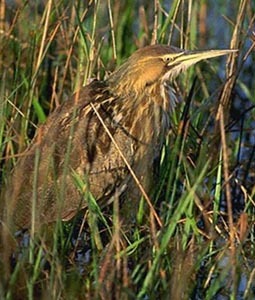 Fish & Wildlife Service, University of Connecticut Cooperative Extension, and numerous land trusts and other groups have worked in many of the marshes along our coast to try to control and monitor the spread of Phragmites australis. As one moves farther inland along the larger coastal rivers, the marshes are no longer affected by the saline waters of the Sound, but are still influenced by the tides. 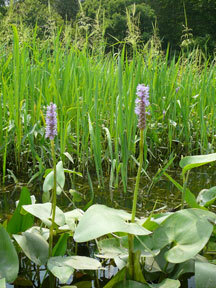 Freshwater tidal marshes and flats are home to a wide diversity of plants. Cattails, sweetflag, pickerelweed, arrow-arum and bulrushes are just a few of the plants to be found. Stands of wild rice (Zizania aquatica) are most conspicuous in the late fall, and provide food for migratory waterfowl. Snapping turtles, water snakes, numerous mollusks, insects and fish live, feed, and lay eggs in these marshes, the tidal flats and creeks. These habitats are among the most productive on the planet, providing food, nurseries, resting areas during storms and migrations and homes for a multitude of animals. The marshes serve as a buffer during storm events, help to slow shoreline erosion and act as a filter, absorbing excess nutrients. 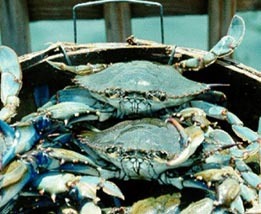 The marshes provide food, habitat and nursery areas for many fish and shellfish species. Most of our commercially and recreationally important fisheries rely on the productivity of coastal salt marshes. 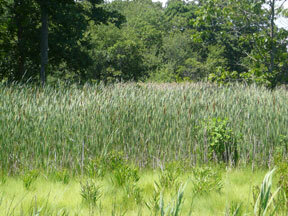 Because salt creates challenges for plant growth, only specialized plants can live in true salt marshes. These natural communities provide, in turn, specialized habitats for unique and often rare species of animals. About 45% of all endangered and threatened species rely on estuarine and coastal waters for survival; many specifically need salt marshes. 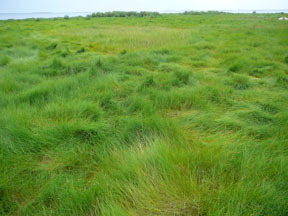 Tidal marshes are directly subject to state regulation under the Connecticut Coastal Management Act, as opposed to inland wetlands, which are regulated by local commissions. High marsh with salt meadow cordgrass (Spartina patens) and the characteristic "cow-licked" appearance. 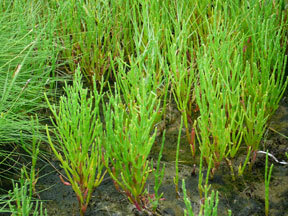 A salt marsh panne with glasswort. Low marsh with smooth cordgrass (Spartina alterniflora). Brackish tidal meadow with cattails. Freshwater tidal marsh with pickerel weed and wild rice.